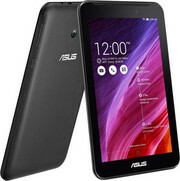 Asus will die neuen Tablets mit 7-Zoll-Display vor allem durch den günstigen Preis an den Mann bringen. 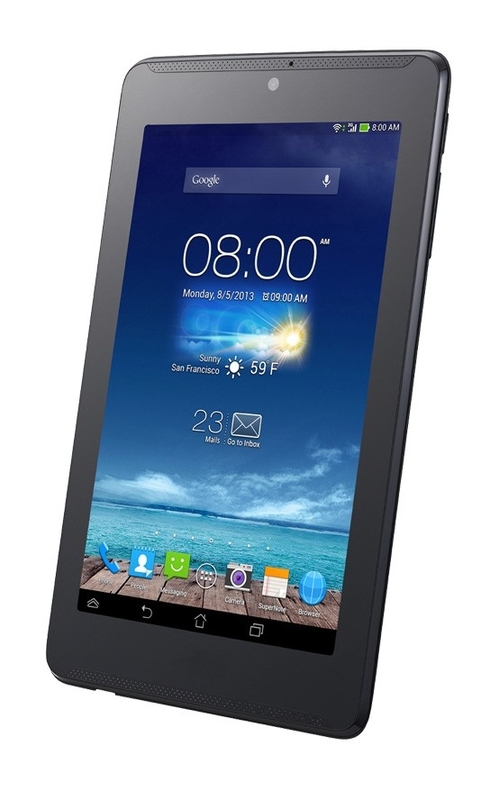 Wer auf der Suche nach einem günstigen Tablet mit Telefonfunktionen ist, sollte die Fonepad 7-Reihe in Erwägung ziehen. Auch wenn sich im Vergleich zur Vorgängergeneration auf den ersten Blick nicht viel getan hat. 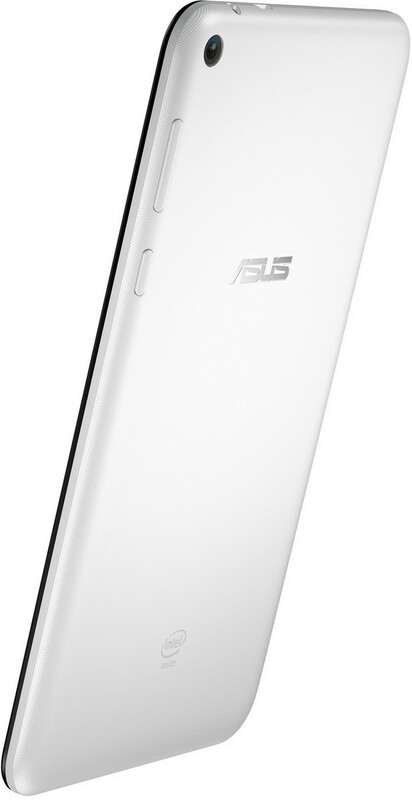 Als leichter und kompakter Begleiter kann das Asus Fonepad durchaus ein Smartphone ersetzen. Das Fonepad kombiniert Smartphone und Tablet in einem Gerät. Wer sich kein 7-Zoll-Tablet ans Ohr halten will, kann natürlich auch über ein Bluetooth-Headset telefonieren. Weitere Besonderheit: Hier kommt nicht wie sonst üblich ein ARM-, sondern ein einkerniger Intel-Atom-Prozessor zum Einsatz. Die Performance ist insgesamt nur mäßig, starke Spieglungen nerven. Als Multifunktionsgerät dennoch nicht uninteressant. For a small business looking for well priced Android device with 3G and a good, large screen while sacrificing some portability, the Fonepad isn't a bad choice. 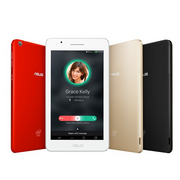 At the same time however, a Wi-Fi only tablet, 7 or 10", and a smaller mobile phone running a hot spot to share 3G or 4G is probably a more elegant choice. What will be our final decision for Fonepad is hard to say. Beside typical tablet usage it focuses on voice calls, which we found awkward when we tried to use it as a typical phone leaning it on ear. Poor voice quality doesn’t help the case, so our recommendation is the use of a Bluetooth headset. In the future, we would also like to see an accessory which will act as a dumb phone (form vise also) and via Bluetooth connect to Fonepad. 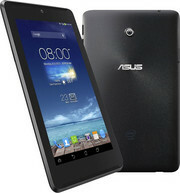 Ревю на ASUS FonePad – малък таблет или голям смартфон? Positive: Beautiful and rugged; IPS screen; battery life; attractive price. Negative: Large size; Missing rear camera; relatively weak SoC. Brett am Kopf. Phablet oder Smartlet – die Welle der großen Smartphones ist seit dem Samsung Note bereits losgetreten. 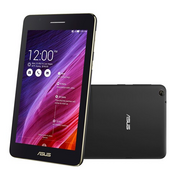 Jetzt kommt Asus mit dem 7 Zoll großen Fonepad, dem Namen nach ein Tablet zum Telefonieren. Mit dem Teil am Ohr sorgt man mit Sicherheit für Aufsehen – noch. Wer auf der Suche nach einem Tablet ist, das nicht nur mit einer sehr guten Verarbeitung punkten kann, sondern auch mit einer integrierten Telefon-Funktion, darf das Asus Fonepad nicht außer Acht lassen. Zwar gibt es an der einen oder anderen Stelle auch durchaus Aspekte, die kritisiert werden können, insgesamt ist das Fonepad aber ein guter Kompromiss aus erschwinglichem Endgerät und solider Ausstattung. Putting this gimmick aside, the Fonepad is certainly a capable budget-friendly Android tablet as it performs adequately across all of our tests, and even exceeding our expectations in its battery and entertainment performance as well as the ASUS-specific applications thrown into the mix. 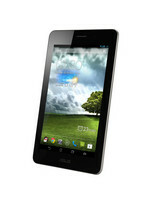 Unfortunately, there are better 7-inch tablets on the market and for cheaper, such as the Nexus 7. 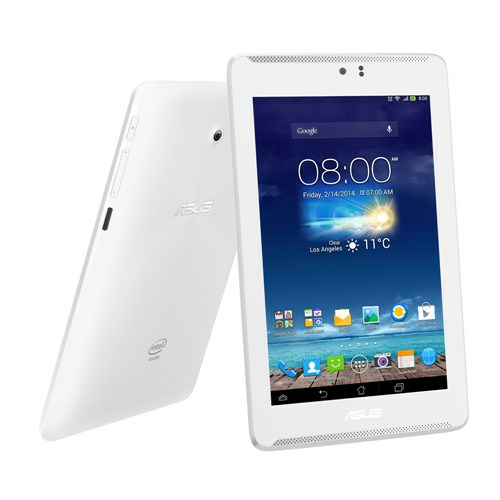 If you for some reason need a tablet that can double as a phone, then your only choice right now is the ASUS Fonepad. But if you’re just looking for an Android tablet that costs below $300, we think you should take a look at the Nexus 7, Galaxy Note 8 and the Amazon Kindle Fire HD as they can offer you a much better experience than the Fonepad can. 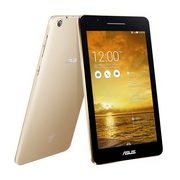 So, can you live with a 7-inch, 340g smartphone? Yes. Naturally there are compromises to be made. I wouldn't want to take a FonePad with me to my local pub for the evening or to a gig, and the absence of a suitable camera is going to become an issue at some point down the line. But the cash savings and the sheer convenience of having one device rather than two to carry and charge does have its attractions. I’m all for affordability and versatility, and the FonePad delivers both in spades. 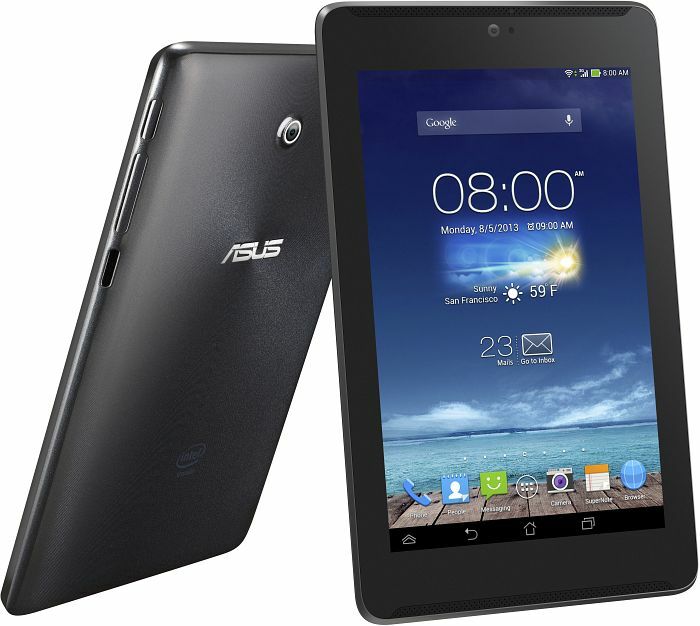 Which makes it the one of the very few budget tablets - the other being the Nexus 7 - I’d recommend to a friend. 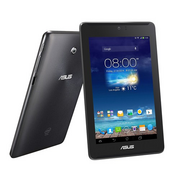 For those genuinely interested in a phablet, the Asus Fonepad is a bit of a bargain. It does the job of two devices for a budget price. However, you'll need to be prepared to make sacrifices including practicality and, in this case, no rear camera and slower performance issues. Not to mention the inevitable Dom Jolly impression, should you decide to use as a phone without a separate earpiece. 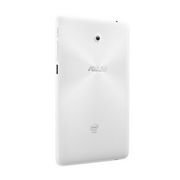 The Asus Fonepad is a direct competitor to the Samsung Galaxy Tab 2 (and also the upcoming Tab 3). 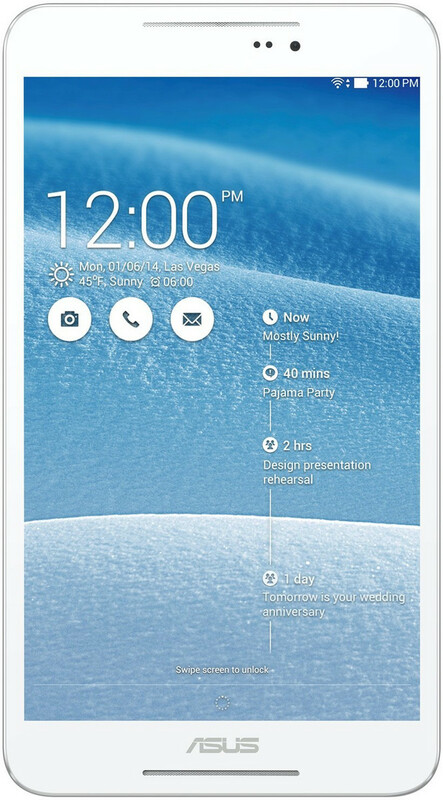 The tablet has some pretty interesting features such as Floating Apps, has the ability to playback video smoothly, make calls and a great build. On the downside, it is plagued with a bit of lag and the rear camera is poor. At 8GB, the built-in storage isn’t great either. 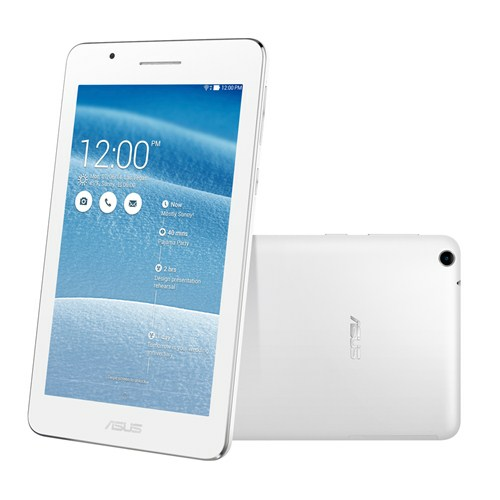 If you are looking for a tablet around the Rs. 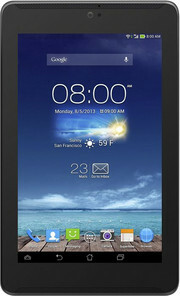 15k price point, you can definitely consider this device along with the Galaxy Tab 2. 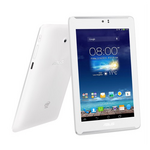 If you are on a tighter budget (10K) you can take a look at the iberry Auxus CoreX2 3G tablet as well. 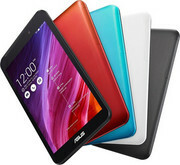 The Asus Fonepad is yet another smartphone/tablet hybrid which aims to attract users who want to carry around one device. 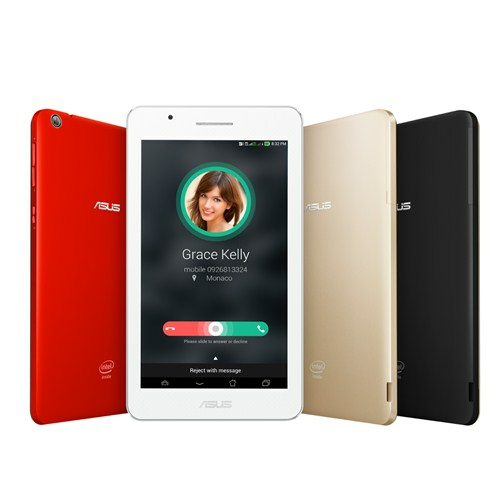 The 7in device functions primarily as a tablet, has a built-in SIM which allows users to calls, send texts and browse the internet. 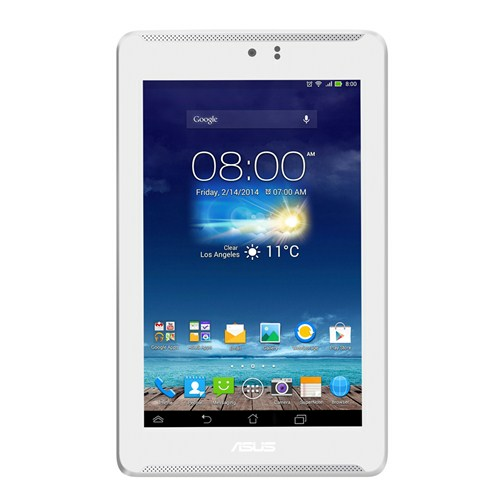 The Asus Fonepad is good value for money considering its a a tablet which makes phone calls, but it is likely to be too cumbersome for most people. The Asus FonePad is priced at Rs 15,999 for the 8GB version, which is a pretty good deal. We would even go as far as saying the FonePad offers more value for money than the similarly-priced Nexus 7. 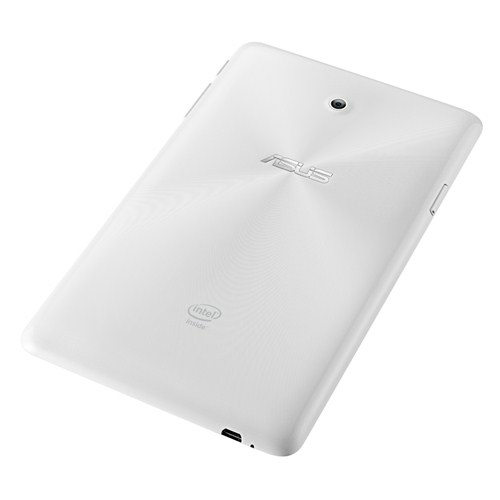 Apart from not receiving updates instantly and the lack of a powerful processor, the FonePad does everything the Nexus 7 does and more. It can run almost any app (albeit heavy apps like 3D games won’t run as well), has a pleasing and functional skin, similar battery life, plays Full HD videos, boasts of expandable storage and it doubles up as a phone. The camera is still a bit woeful although we do appreciate the inclusion of it and the fact that it’s auto-focus. The only major downside that we came across is the fact that it can get a little sluggish now and then. 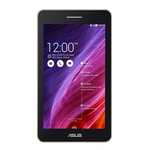 Between this and the Samsung Galaxy Tab 2, we’d recommend the Asus FonePad for its higher resolution screen, (relatively) better auto-focus camera and better battery life. The Fonepad does have some weaknesses, not least the fact that you'll have to wait on Asus for OS updates – with the Nexus 7, you get the latest version of Android as it's released. It isn't wonderfully practical to use as your everyday smartphone, either. But, even if you think the phone capabilities are little more than a daft frivolity, there's no denying the Fonepad packs a hell of punch for a budget tablet. It's good enough, even, to elbow aside the iPad mini at the top of our A-List. Positive: Good multimedia support and flexible operating system. Positive: Price; decent screen and case; high quality materials, good looks, good build. Negative: Performance. Telefon-Tablet. Beim Asus Fonepad 7 ist der Name Programm: Äußerlich ein 7-Zoll-Tablet steckt im Android Testkandidaten zusätzlich ein vollwertiges Telefonmodul. Wie unser Test zeigt, stimmt beim Mittelklasse-Gerät auch die Performance. 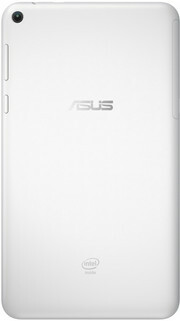 Das überarbeitete Asus Fonepad 7 (ME372CG-1B057A) bietet einen schnelleren Prozessor und eine bessere Ausstattung als der Vorgänger, bleibt aber ähnlich günstig. Das Display zeigt sich im Test aber einen Tick schwächer. Nach wie vor cool: Mit dem Android-Tab können Sie sogar telefonieren. 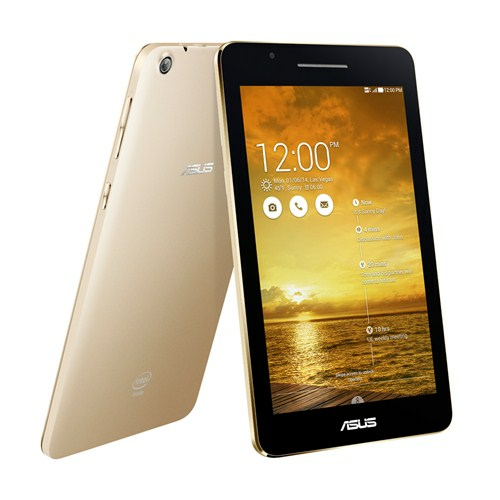 Wer nach einem Tablet mit Telefon-Funktionalität zum günstigen Preis sucht, der sollte das Fonpad 7 von ASUS in jedem Fall in die engere Auswahl mit einbeziehen. 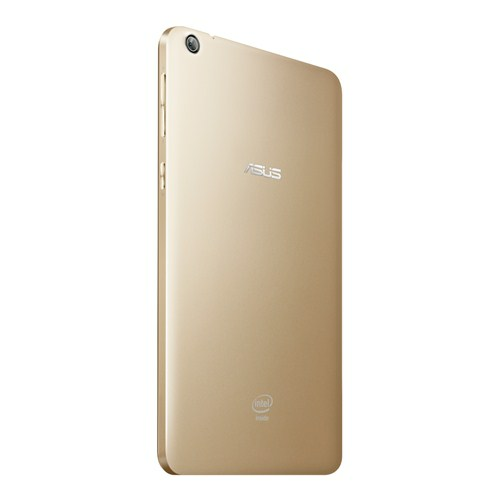 Mobile Daten (wenn auch „nur“ via 3G), ein geringes Gewicht von unter 330 Gramm, gute Lautsprecher, schickes Design und eine überzeugende Leistung sprechen für das Tablet von ASUS. 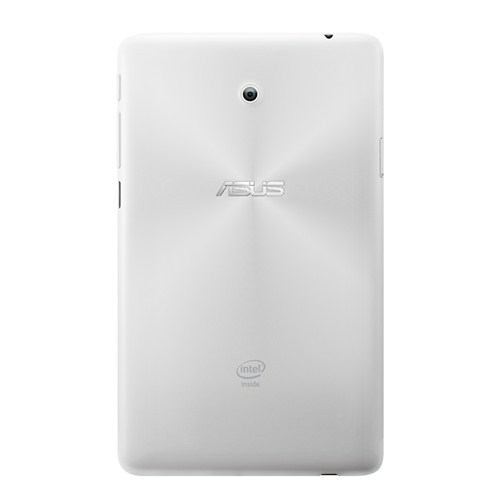 Positive: Powerful sound system; good viewing angles of the display; good performance. Positive: Micro SIM slot; relatively fast Intel Atom chip; stereo sound; good quality camera; long battery life. Negative: Relatively thick side frames. 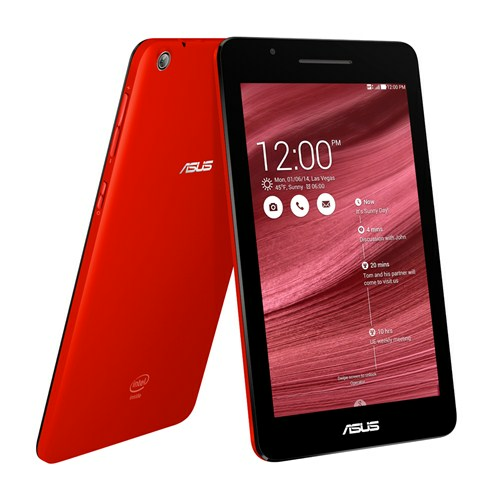 Das Asus Fonepad 7 ist ein Hybride, der es Wert ist, in Betracht gezogen zu werden, wenn man sich auf nur ein All-in-One-Gerät beschränken möchte. Mit seinem 7-Zoll-Formfaktor kann es leicht genug mit einer Hand bedient werden und er erleichtert Telefonieren. Sein IPS Bildschirm mit einer Auflösung von 1280 x 800 bietet eine großartige Blickwinkelstabilität und eine HD Auflösung für das Abspielen von Medien. Der Prozessor ist eine etwas ungewöhnliche Wahl. Mit Intels Atom Z2420 Prozessor und 1 GB RAM gehört es nicht unbedingt zu den Geräten mit der besten Leistung, doch es erfüllt seinen Zweck. Der Prozessor braucht sehr wenig Strom, was sehr gut zu dem 4270 mAh Akku passt. Es sind ungefähr 9 Stunden Nutzung möglich, eine beeindruckende Zahl für ein Tablet dieser Größe. Dass es keine rückwärtige Kamera gibt, mag einige vom Kauf abhalten (nur das US-Modell bietet eine). An der Vorderseite befindet sich eine 1,3 MP Kamera, die 720p HD-Videos aufzeichnen kann und gut für Video-Telefonie ist. Mit dem Fonepad 7 bekommt man auch Android Jellybean ohne Bloatware, die andere Hersteller gerne auf ihren Geräten installieren. Die Speicherkapazität ist nur 16 GB. Das mag nicht viel erscheinen, doch microSD-Karten werden unterstützt. Zudem gibt es Dual-SIM-Support. Es handelt sich um ein durchwegs solides Gerät zu einem leistbaren Preis. 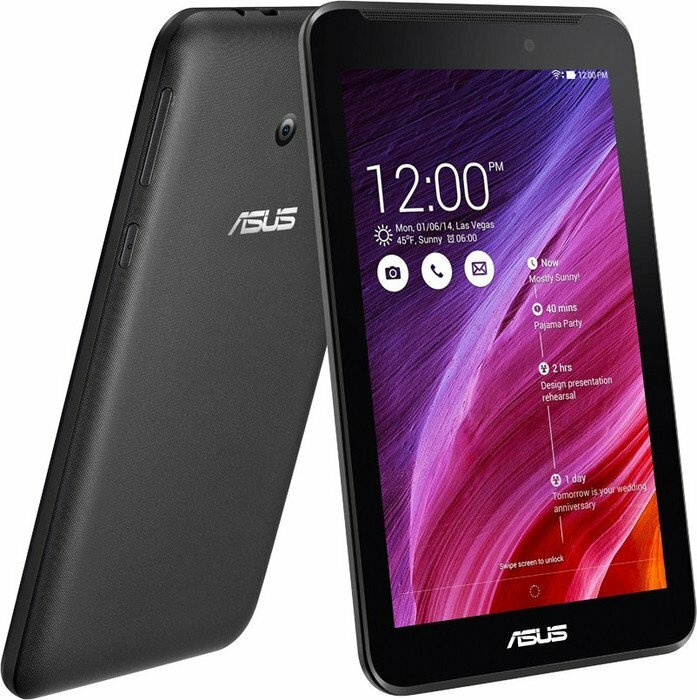 Im Test kann das Asus FonePad7 ME175CG vor allem durch das geniale Preis-Leistungs-Verhältnis überzeugen. Für wenig Geld bekommt man doch eine recht ordentliche Hardware, von der man nicht erwartet, dass diese so günstig ist. Einziges Manko ist das etwas zu dunkle Display, aber für solch einen Preis, trotzdem ein HD IPS-Display zu verbauen, ist sicherlich nicht einfach. 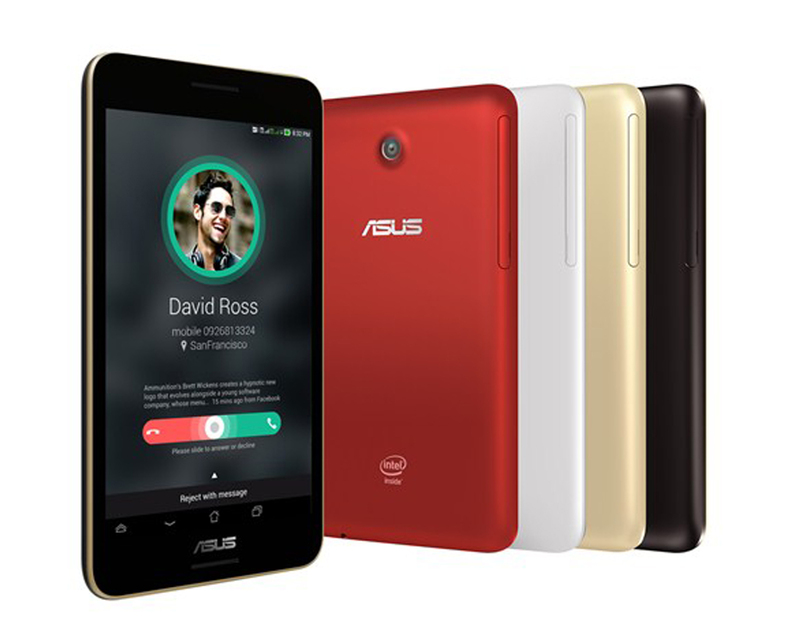 If you are looking for a tablet which gives you the capability to make calls with its dual-SIM card slots and a decent look in budget price, then the Asus Fonepad 7 is the perfect choice for you. The hardware though, isn't very promising and the tablet is definitely not for the ones who need a device for graphic intensive tasks like gaming. Positive: Good workmanship; 3G support; Intel's Atom platform; good price; good color reproduction of the screen; good audio output. Negative: Position of the speakers; narrow viewing angles of the display; thick. Positive: Robust case; quite high contrast of the display; clear and loud sound of the speakers; good performance; good battery life. Negative: Low brightness of the display. 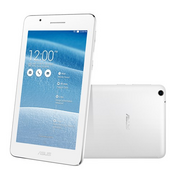 Das neue Asus Fonepad 7 FE170CG ist das dritte in der Fonepad-Serie der Phone-Tablets (besser als Phablets bekannt). Dieses 7-Zoll Phablet hebt sich von seinen Vorgängern, nämlich dem Fonepad 7 ME371MG und ME372CG durch Leistbarkeit und Design ab. Mit einer Breite von 11 cm passt es bequem in die Hand. Zudem ist es mit nur 290 g das leichteste der drei Geräte. Um das Fonepad 7 FE170CG für alle mit engem Budget kaufbar zu machen, hat Asus viele Features gekürzt, die man in den Vorgängern findet. Zum Beispiel die Frontkamera löst nur mit 0,3 MP auf (Vorgänger: 1,2 MP). Die rückwärtige Kamera hat nur eine Auflösung von 2,0 MP, die niedrigste unter den Fonepad 7. Die anderen Eigenschaften des Gerätes sind ziemlich Standard: ein 1024 x 600 Bildschirm, ein Intel Atom Z2520 (1,2 GHz) Prozessor, eine 1,2 GHz Dual-Core-GPU und 1 GB RAM. 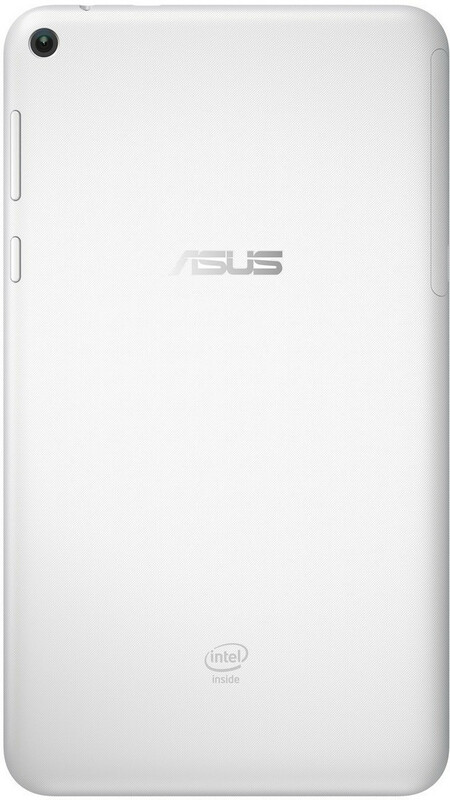 Ein ermutigendes Detail am Asus Fonepad 7 FE170CG ist sein erweiterbarer Speicher. Es werden microSD-Karten bis zu 64 GB unterstützt. 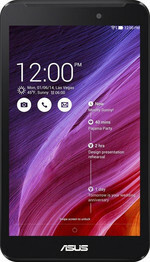 Das Gerät nutzt die speziell von ASUS entwickelte ZEN UI Benutzerschnittstelle auf dem Android Jellybean 4.3 Betriebssystem, welche sauber, ordentlich und leicht zu organisieren ist. Es handelt sich um ein ideales Gadget für alle mit kleinem Budget und niedrigen Ansprüchen an Leistung. There are other options in the form of Flipkart's own Digiflip Pro ET701, which has a similar set of specs and is priced much lower than the Fonepad 7. It is missing the voice-calling capability though. The Digiflip Pro XT801 on the other hand has much better specifications but once again doesn't have voice calling features. 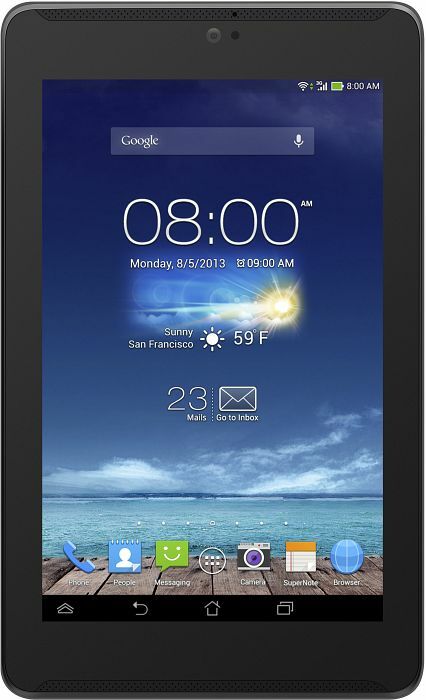 At this price, the Fonepad 7 hits the sweet spot by offering voice-calling. Just make sure you always carry a cloth to wipe fingerprints with. Positive: Good build quality; good brightness and contrast of the display; sophisticated sound system; excellent performance. 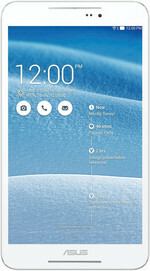 Positive: Very attractive price; good IPS-screen; good autonomy. Negative: Mediocre front webcam. Das Asus FonePad 8 erweist sich im Test als preiswertes und kompaktes Tablet mit praktischer Telefon-Funktion und toller Laufzeit. Die verbaute Intel-CPU ist zwar nicht die neuste, sorgt in der Praxis aber für gute Performance. Nicht mehr zeitgemäß sind dagegen die niedrige Auflösung von 1280 x 800 Pixel und der kleine 8-GByte-Speicher. 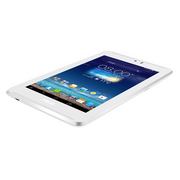 If you are looking for a tablet that you can also use as a phone, you could perhaps consider this one. If you plan to replace your phone altogether, we'd recommend phablet-sized phones such as the Yu Yureka (Review | Pictures), which are a lot easier to handle. The benefits of the bigger screen are negated by too many other factors when it comes to the Asus Fonepad 7 (FE171CG). PowerVR SGX540: PowerVR SGX544MP2: OpenGL ES 2.0 kompatible Grafikkarte mit 8 Pixel- und 4 VertexshaderPowerVR SGX544: OpenGL ES 2.0 kompatible Grafikkarte mit 4 Pixel- und 2 VertexshaderDiese Karten können nur sehr alte und sehr anspruchslose 3D Spiele flüssig darstellen. Anwendungen wie Office, Internet surfen, Bildbearbeitung oder (SD) Videoschnitt sind jedoch ohne große Einschränkungen möglich. Imagination PowerVR G6430: Multicore (4 Cluster) Grafikchip für ARM-Prozessoren. Wird unter anderem im iPhone 5S (Apple A7 SoC) eingesetzt.» Weitere Informationen gibt es in unserem Notebook-Grafikkartenvergleich und der Benchmarkliste. 75.73%: Weltbewegend ist diese Bewertung nicht. Obwohl es bei den meisten Websites einem "Befriedigend" entspricht, muss man bedenken, dass es kaum Notebooks gibt, die unter 60% erhalten. Verbalbewertungen in diesem Bereich klingen oft nicht schlecht, sind aber oft verklausulierte Euphemismen. Dieses Notebook wird von den Testern eigentlich als unterdurchschnittlich angesehen, eine Kaufempfehlung kann man nur mit viel Wohlwollen darin sehen. » Lesen Sie auch unsere Notebook-Kaufberatung.